Harvard has a long history with ROTC, the college program that trains officers for the U.S. military. For the last 40 years, however, that relationship has been at arm's length. Harvard students wishing to join ROTC have had to do so through MIT. Of course, getting up a little earlier to run across town is the miltary's idea of good training. But still there was an element of second-class citizen-soldiership. Harvard's official rift occurred because of the Vietnam War but had been extended over policies against gays serving in the military. With the DADT policy all but repealed, Harvard stepped up to reenlist. This Friday Harvard President Drew Faust signed an agreement with the U.S. Navy to bring ROTC back on campus officially. The Harvard ROTC in May 1917. This was back in the days when the students sang "ten thousand men of Harvard want victory today" and meant it. 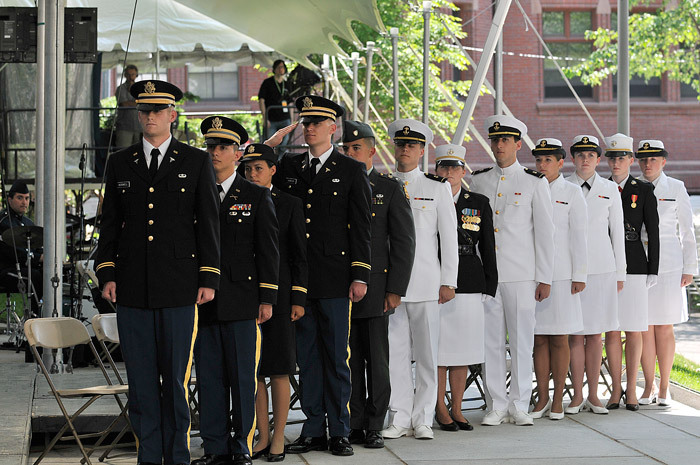 The Harvard ROTC commissioning ceremony in May 2010. A dozen graduating cadets in all were commissioned. More Harvard ROTC pictures can be found at the Harvard Gazette. Agreements with the other military services are expected to follow. Whether ROTC enlistments rise remains to be seen. Joseph Warren - killed in action at the Battle of Bunker Hill in June 1775. Robert Gould Shaw - killed in action leading an assault by the all-black 54th Massachusetts Regiment on Fort Wagner near Charleston, South Carolina in July 1863. Leonard Wood - carried dispatches over 100 miles of hostile territory during the Apache campaign in the summer of 1886. Theodore Roosevelt - led the charge up San Juan Hill in Cuba during the Spanish American War in 1898. Charles White Whittlesey - commander of the "Lost Battalion" which held out until relieved for six days after being surrounded by German troops in the Argonne Forest in October 1918. John F. Kennedy - commander of PT-109 which was rammed and sunk by a Japanese destroyer in August 1943. Theodore Roosevelt, Jr. - rallied the troops landing on Utah Beach on D-Day June 6, 1944. Sherrod E. Skinner - killed in action when he threw himself on an enemy grenade in Korea in October 1952. Robert C. Murray - killed in action when he threw himself on an enemy grenade in Vietnam in 1970. A plaque in Harvard's Memorial Church honors the 17 Harvard University graduates who have been awarded the Congressional Medal of Honor.